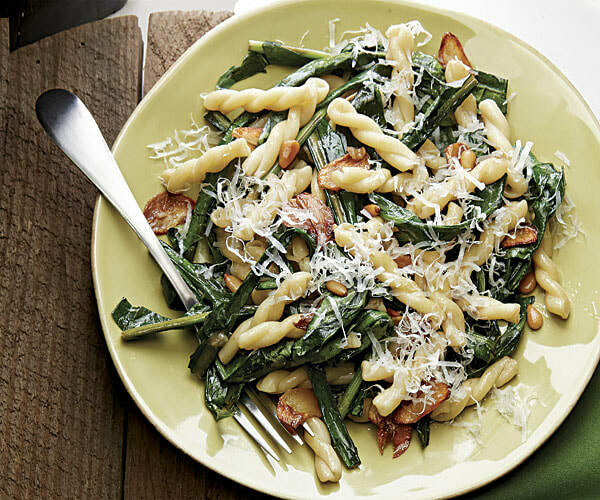 The mellow flavors of sweet pine nuts and toasted garlic complement the bitter greens in this comforting pasta dish. Meanwhile, cook the oil and garlic in a heavy-duty 12-inch skillet over medium heat, stirring occasionally with a slotted spoon, until the garlic is golden, 3 to 5 minutes. Transfer the garlic to paper towels to drain. Add the pine nuts to the skillet and cook, stirring frequently, until golden, about 1 minute. Transfer to the paper towels with the garlic. Add the greens to the skillet and cook, stirring, until wilted, 1 to 2 minutes. Stir in the vinegar and season to taste with salt and pepper. Keep warm over low heat. Boil the pasta according to package directions. Reserve 1 cup of the pasta cooking water and drain. Add the pasta to the skillet and toss with the greens. Add the garlic, pine nuts, and half of the cheese, and toss to combine, adding some of the pasta cooking water to moisten, if necessary. Serve garnished with some of the remaining cheese, and pass the rest at the table.